I don't know where to begin. This has been an amazing week for my husband and I and my daughter's family. 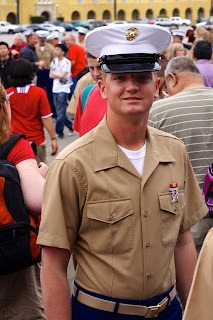 My grandson finished his Marine Corp basic training and we attended the celebration attached to that mile stone. Honestly, I did not know what to expect. I knew I was about to experience the Marine Corp as it opened the doors a crack so the families of those men that finish their recruit school could get a glimpse of their life. They had been in training for 3 month and had not heard any music save taps I suppose. Contact with their families was only what they received in letters and they did not have snack bars or a leisurely moment to themselves during that period of time. In the Marine Corp the Drill Instructors spend that 24/7 with the men for that 12 week period. I am sure that many of you have either been in the military or had a member of you family decide to devote a part of their life to their country. My husband was in the Navy. But I was not prepared for the Marine experience in anyway. Men join the Navy to "See the World" or at least that is the recruiters tag line when they entice young men to join. But what I heard from the Drill Instructor on Family Day was that the Marines join to fight wars and their service is all about keeping our country safe with weapons in their hands. "Every recruit is first and foremost aware that they are expected to carry a weapon." The video we were shown was all about the battles these men had fought in past wars beginning very early in our country's history. As a grandmother I fought back tears because I remember my generation's war. But my grandson has had his eyes on this adventure for a very long time. He will turn 20 next Friday. He is a self taught expert on weapons and actually helped the rest of his company when they had problems. He survived The Crucible, a final push in the training that required extreme physical effort, hunger and extended periods without sleep. It is a shared experience he will never forget. We sat with his bunk mate for lunch on family day and they talked about that Crusible experience. The memory of seeing nothing but brown uniforms covered with dirt while feeling extreme fatigue and hunger was burned in their mind. When they were given a clean shining orange, they marveled at the color of the beautiful fruit they held in their hand. Not only was it food for their bodies but it brought their minds to life again. A proud family with their beautiful Marine. First picture as a vested Marine...the beginning 12 week completed. The smiling man is my grandson. They talked about those that were willing to own up to their mistakes and those that would never admit to an error even if the whole company suffered. It is in fact not only a test of physical endurance but a test of moral integrity. My grandson made me very proud when he told about how he had owned up to a mistake. No one would have told but he did not want the whole company to suffer for something he had done without thinking. He was given a little more "training" than the rest. The truth goes a long way. He just smiled because he understood what he had done and thought it was fair. I will never forget the grin on his face when he spotted his mother and father in the crowd on family day or how he could not eat slowly. I could feel his hunger for music and a talk with his girl friend. His grandfather, Grandpa Earl, gave him the hunting rifle he had bought with money earned working on a ranch when his was 14-15 years old. The rifle provided food for our family in the early years of our marriage. It is still beautiful but an antique now. It was not new when my husband first held it in his hand in 1952. I am home now. My flowers are in bloom and the sun is shining. But I am not the same and never will be again. This is a stage of life. I watch. I worry. I pray. But most of all I embrace my grandson's choice. We all have to live life our own way. His is an honorable choice.